← What’s in your head? 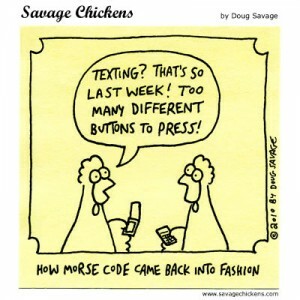 Text is a form of communication. 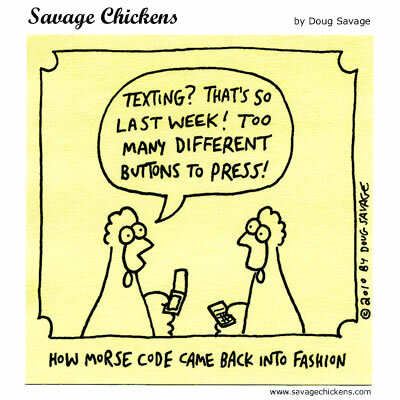 This comic incorporates four types of communication, (1) ‘written text’ which is displayed by the actual comic; (2) ‘texting’ referring to the exchange of written text between phones; (3) ‘morse code’ which is a form of communicating/transmitting text through a series of quick on and off motions through tones, lights or clicks; and finally (4) ‘verbal’ communication where the two chickens are talking to one another. It also shows how methods of communication can shift in popularity. This entry was posted in Text and tagged communication, text. Bookmark the permalink.